Selena and Woody are Ready to Ride at Badminton! 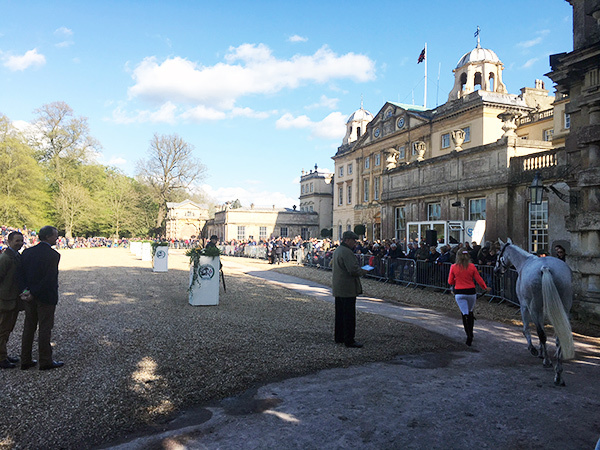 We’ve Made it to Badminton! Jog time, with the Badminton House in the background. It was a good turn out to watch the jog. In the afternoon we did a light school with Christilot in the ring. The weather was pretty brisk so Woody was feeling good after his run and didn’t mind the extra work. Sunday mid-morning Christilot got on Woody to see how he felt. She did some great canter work with him, making sure his hind quarters were underneath him. They worked on downward transitions, making sure he didn’t “dump” onto his forehand and softening his right side a little to make him straighter and more supple on the right rein. When I got on I did a little of the same in canter and we worked through trot work section of the test in walk using the mirrors. At the end of our ride we did a few medium trots down the long side. I had to walk him for ages at the end because he was being a bit tense and silly in the cold wind. Monday was a busy day. He had the last of his light therapy treatment, massage/physio from Becky, a lesson in the grass ring in the p.m. I had a chiro appointment for myself in the p.m., plus we had to pack and organize. Phew! Worked through the test with Christilot. Practiced the canter half passes without the change. Really needed to get straighter on the quarter line after the left hall pass and improve our suppleness on his right side in preparation for the change. We also worked on the centerlines transition to halt from canter. Making sure he collects and stays light in front so he can be square. Tuesday a quick jump in the a.m. A repeat of the ground poles to the warm up fence to start. Woody was super here and never missed a ground rail once. 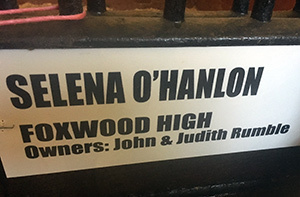 An oxer, three strides, to two verticals, one stride apart. I really worked on slowing my shoulders and got the feeling quite well at one point. Always a struggle for me. I’ve tried all sorts of methods to improve this fault of mine. I get to stay in the Badminton house this year. Foreign riders will be there instead of the caravans we were in, in 2011. Pretty neat! Also above the canteen but no WiFi. I rode Woody with Christilot in the warm up rings and he was fresh but put it to good use. We worked on the half pass in canter again. He was much straighter and more supple through his right side. The changes were good, we just made sure to do them elsewhere in the ring so he won’t anticipate them during the test. 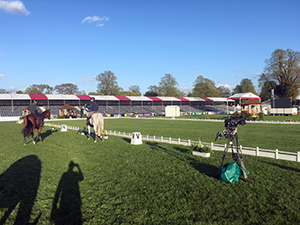 Mark Todd and Oliver Townend walk the course. Wednesday it was pouring when I got up and was horrible till late morning. 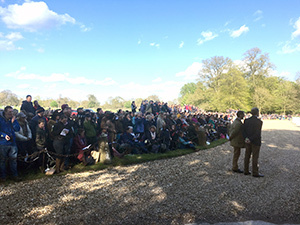 The sun came out for a bit and our briefing was at noon. I took Woody back to the warm ups for a lesson but there was cross country running (lower level). Woody heard the announcers and saw the horses running xc and lost his little mind for a while. The rings are bogs so I worked on the side of a slope with a few others. Mark was riding Leo there (having a lesson) so I thought if I rode near them Woody might settle near a friend. Unfortunately the xc was having the same effect on Leo. Luckily we got through our rides and they were pretty good by the end. I walked the xc quickly with Mark around 2:00 p.m. and we ended up walking most of it with Ollie too. 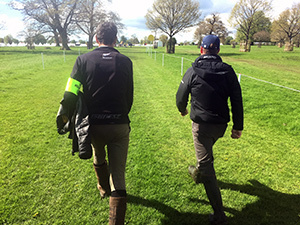 I have to admit I was seriously enjoying walking the course with Mark Todd and Oliver Townend. CHAMPIONS!! It’s huge and the ground is undulating wherever possible (and sometimes even when not). It poured all morning so it’s pretty wet right now but I’m hoping the wind and sun will improve the going before Saturday. I’ll do a course walk video next time I’m out there. We had to hurry back for the first horse inspection which was at 4:30 p.m. The wind was cold but the sun did shine. I was so excited to wear the first of my three fabulous new outfits by House Of Angelis! Mega thanks to these lovely sponsors who dress to impress. I always feel classy and comfy in theses designer outfits. It’s true what they say when you look good you feel good. Woody felt good too. After being primped and preened by the wonderful Anne Marie he posed for the cameras just long enough before strutting his stuff on the runway in front of Badminton castle/house. He’s so fit and the weather is so cold I was a bit worried how he would handle the crowd. I was pleasantly surprised with his ability to hold it together for the most part. There were plenty of others who were wild and worse behaved then him. I took him up (or rather he dragged me) to ring familiarization between 6:00-7:00 p.m. It’s about 25 mins walking in hand and when I got there I found out you have to have a bridle (Badminton rules). Eeek!! It was now 6:33 p.m. and I was up there to hand graze him in the ring but wasn’t allowed. Luckily my phone let me make a call (Canadian phone problems) to Mark and he loaned AM his bike so she could jet up to us with a bridle. We just got in there in time to let him walk around and graze a little. He’s still pretty high…hopefully he puts all this energy to good use tomorrow for our 2:16 p.m. test!